The Orbital Sciences Corporation Antares rocket, with the Cygnus cargo spacecraft aboard, is seen in this false color infrared image, as it launches from Pad-0A of the Mid-Atlantic Regional Spaceport (MARS), Wednesday, Sept. 18, 2013, NASA Wallops Flight Facility, Va. When a commercial Antares rocket launched a brand-new private cargo ship into orbit from Virginia's Eastern Shore this week, professional news photographers were ready. But NASA photographer Bill Ingalls took the event one step further to create a truly spectacular view that human eyes would never see on their own, with a dash of false color. The Antares rocket launched into space Wednesday (Sept. 18) from Wallops Island, Va., carrying the first Cygnus spacecraft on a test flight to the International Space Station. 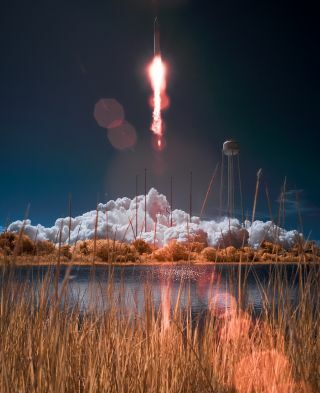 Both the rocket and robotic Cygnus craft are built by the commercial spaceflight company Orbital Sciences Corp. of Dulles, Va.
To capture the moment, Ingalls — a veteran NASA photographer — used a digital SLR camera to photograph the launch in infrared light, NASA officials wrote in an image description. The image was then processed to present this false-color view. You can see more amazing launch photos of the Cygnus spacecraft here. Orbital Sciences launched the Cygnus spacecraft into orbit from NASA's Wallops Flight Facility at 10:58 a.m. EDT (1458 GMT). It lifted off from Pad 0A operated on the Wallops grounds by the commercial Mid-Atlantic Regional Spaceport. The spacecraft is flying its first demonstration flight to the International Space Station to show that the Cygnus is ready to begin a series of eight cargo delivery missions for NASA under a $1.9 billion contract between the agency and Orbital Sciences. After a smooth launch, Orbital Sciences' Cygnus spacecraft is now on course to rendezvous with the International Space Station early Sunday (Sept. 22). The capsule is loaded with the biggest cargo delivery by a private spacecraft yet — 1,543 pounds (700 kilograms) of supplies for the Expedition 37 crew. SPACE.com is providing complete coverage of the Cygnus spacecraft mission. The Cygnus vehicle will spend about one month linked to the space station. After undocking in October, it will be intentionally commanded to burn up in Earth's atmosphere to end the mission. Orbital Sciences hopes to launch the first full delivery mission to the International Space Station as early as December, company officials said.